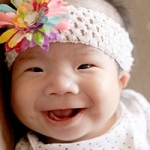 “While all our children’s adoption stories are amazing to us (we’ve adopted 3 children from China) and Father written in their own individual ways, the most amazing story of all came with our adoption of Nora Mei. After bringing our last adopted daughter Macie Joy home in 2016, we were certain we would be led to a season of rest and raising our then nine children. He does have quite the sense of humor and writes the best stories though when you’re willing to follow Him – Right?! Shortly after coming home from China with Macie, I would get messages asking me if we saw the photo of Macie’s “sister” on a Facebook page. The same Foster Home that our children Stella and Levi were cared for at has a Facebook page where they share photos of the children currently in their care. This is amazing for the families waiting to adopt these children, as it’s such a blessing to watch them grow and learn, glimpsing into their lives. 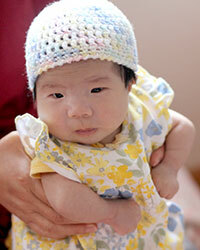 It’s also a way for the Foster Home to give updates to their current sponsors. The little girl they referred to was definitely a sweetheart and looked a lot like our new daughter, but our hands were full as we settled into life with a new child. I tried to ignore it..really I did! Another message and another would come – gentle nudges to take notice. Then one day our daughter and a friend of hers were visiting each other in China (her sweet friend was a volunteer nurse at the Foster Home). They sent me a side by side collage of the two girls – the little one at the Foster Home on the left and our daughter Macie on the right. We were blown away at how much they resembled each other! The similarities were amazing. Little dark eyes, little pink lips, thick black hair, little hands and feet – all so familiar, it was like we knew her by knowing Macie Lots of questions as we tried to discover more. 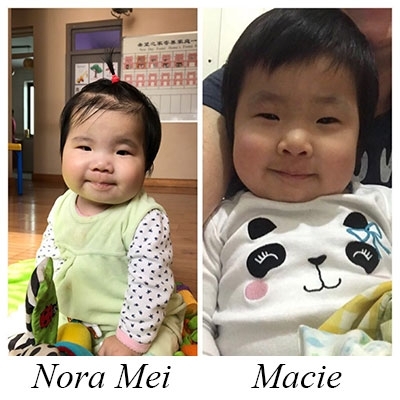 We found out this little girl also had the same genetic orthopedic condition Macie has – and Macie’s dr confirmed with us that siblings can share this condition. We began to ask many “what if” questions. 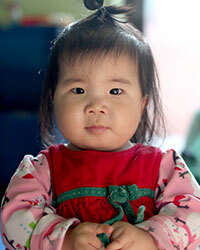 “What if she had a sister in China?”… “What if” we didn’t find out? The thought of that… being an adoptee myself, not letting her know a biological relative hit very close to my heart. 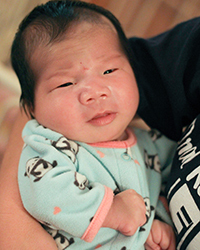 In March we sent our story and suspicions to China and asked the Foster Home who had her in their care what they thought and if we could do a DNA test on thetwo girls. They agreed, although skeptical – who wouldn’t be! 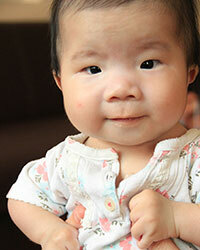 China has a huge population – to find a sibling or relative would be a miracle. We knew our request sounded crazy – it did to us too! 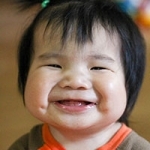 They swabbed the little girl’s cheeks for the test. 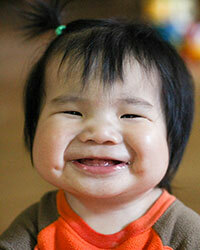 We swabbed Macie’s cheeks and both were sent to a lab here in the US for analysis. We choose a lab that was recommended by other adoptive parents who had discovered siblings and one that tests more sibling markers than any other so we could be confident in the results. The girls are not from the same orphanage, but not too far from each other. We have a few theories, but can only speculate as to how they ended up in different locations. We didn’t know what to expect really. So we waited for the results. Our Father is SO good y’all! The girls are biological SISTERS! His amazing hand is all over this and we stand amazed how this little girl was woven into ALL our adoptions by being placed at the same Foster Home our other two kiddos are from. Right where we would see her – just amazing. Amazing! Just writing this makes my heart beat faster. Watching Him work so intimately in our lives is just something words can’t even properly express. Just wow. Miracles do take place everyday to ordinary people. When your faith seems small….when you question….remember this. He knew. He knew before we adopted Macie that this younger sister would be born with the same genetic orthopedic condition she has. He knew they would share facial features. Sadly, He knew they would both be orphans. He knew she would be placed somewhere to be FOUND! He knew she would be a biological sister to one and a completely amazing sister to many! Our hearts break for the orphans in China and for the birth families for reasons we may never know had to place their children in someone else’s care. But we are so excited now to raise the girls together. They were meant to know each other. 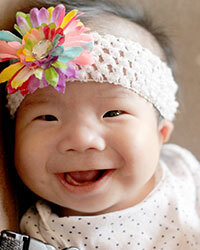 Through the miracle of adoption, Nora Mei is a sister to not just Macie, but to every one of the children in our family! 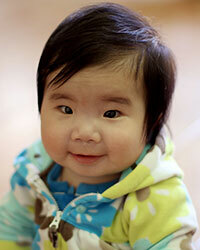 This adoption may have been unexpected by us, but it was not to our Father. There’s no doubt that He brought us here to this place to know this information, and to bring the sweetest little girl into our family. We absolutely recognize the amazingness of this story and hope that our testimony, the girls story, can be used to bring Him glory. And to say we love Nora Mei to pieces – is not enough. She is our treasured daughter. ? ?